Vegan Ramen at Ramen Hood in DTLA - yes, that "egg" is 100% vegan! Ramen Hood is one of the most buzzed about new restaurants, located in downtown Los Angeles' Grand Central Market among many other food vendor stalls in an airy, industrial-style building. Ramen Hood is the brainchild of Top Chef winner Ilan Hall, and while the chef isn't vegan, everything on the Ramen Hood menu is. I have been dying to try this place for a few months now. I mean, I cannot remember the last time I had vegan ramen - I know several places offer it (many of the Asian vegan restaurants or those with vegan options offer a vegan ramen), but the only vegan ramen I've had recently is instant ramen. So you can imagine my excitement when a legit vegan ramen place opened up! Finally, I can get my slurp on! Poqet Donuts (Poqet is pronounced "pocket") recently opened up in Irvine, California, and to my delight I learned they had several vegan donut options available! Poqet Donuts is kind of a "build your own" donut place, like Donut Friend in Los Angeles. Like Donut Friend, they also have many donuts already prepared. Unlike Donut Friend, the majority of their donuts are not vegan (boo), however they do offer two vegan donuts at this time - a Samoa flavor and a Strawberry flavor (woo hoo!). When I started making my list of the best horror movies of 2015, I remember thinking that it would be a tough task, as 2015 didn't really stand out for me as a banner year for horror movies. I felt like there just weren't that many new releases and it would be hard to come up with 10 horror movies I adored this year. However, as I started making my list, I realized that this year it was about quality over quantity, and that there were several stellar horror releases in 2015. This year (and as usual), indie horror reigned supreme, and while I already had most of the horror movies mentioned below on my radar, there were a few pleasant surprises! Another surprise was how varied my favorite horror movies were, from comedies to romance to gothic to artsy to gory to holiday horrors! Lots of different sub-genres this year, which I always count as a good thing! I did find a pattern for many of the horror films I did end up enjoying. While some of the best horror movies of 2015 were raucous, fun affairs, I found that the majority of the ones I liked best were actually understated and subtle, films that really stuck with me long after I finished watching them. There were also several challenging horror titles, which I had to watch multiple times to decide whether I loved or loathed them (and at least one of my picks I'm still conflicted about). So below, please find my top 10 horror movies of 2015! I've had such great success with Follow Your Heart's much-coveted VeganEgg! I've made vegan scrambled eggs and omelets with it and experienced mouth-watering results, so I decided I HAD to make a vegan quiche with this magical product! Today is the winter solstice, which marks the beginning of winter! We usually don't see too many horror movies this time of year, due to the holidays and the months of January and February are usually kinda barren for cinema. However, the next couple of months will bring some rather intriguing horror films to see! Below you will find 5 of my most anticipated horror films in the coming months. The Goddess Provisions monthly subscription box was created by the lovely couple behind the awesomely successful Vegan Cuts subscription boxes (my reviews of the snack box and the beauty box). The Goddess Provisions box is geared more towards getting in touch with your self and the Earth while nourishing both, along with mind, body, and spirit. The monthly box features aromatherapy, crystals, superfoods, natural makeup, and other tools for spiritual growth! Everything is always cruelty-free and vegan, and there are about 4 - 6 full-size products in each box. 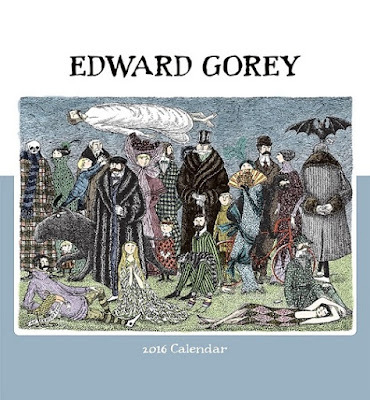 Maybe it's my nerdy side, but towards the end of every year I enthusiastically look forward to picking out my calendars for the next year. I generally buy one for work, then another two for my home. I used to diligently record birthdays, anniversaries, events, holidays, concerts and so on in my calendars, but now that my phone handles all that I generally use them as a point of reference and wall decorations. While wall calendars aren't altogether necessary anymore, I still like having them around, especially since there are so many different options for them out there! 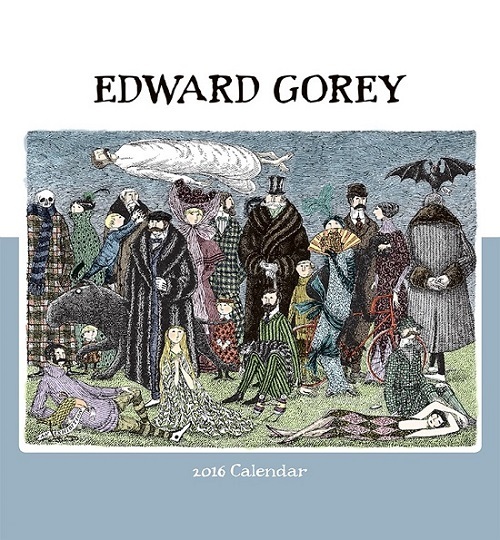 I've been keeping an eye out for cool, creepy calendars that fit my personality, and this year there are so many options in keeping with the gothic aesthetic I so love! 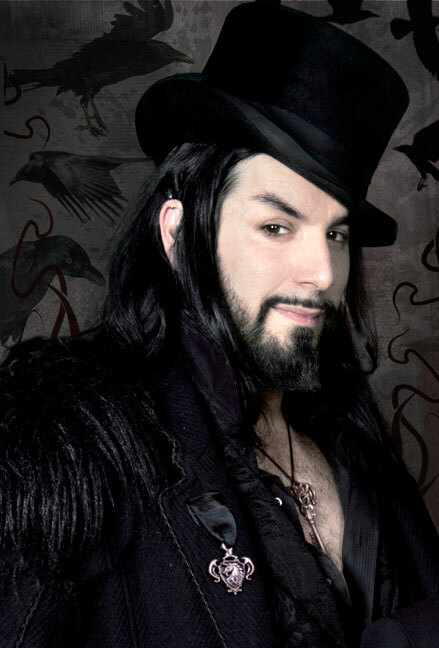 Stumped for a gift for your favorite dark heart? One of my favorite gifts to give and to receive is a book! 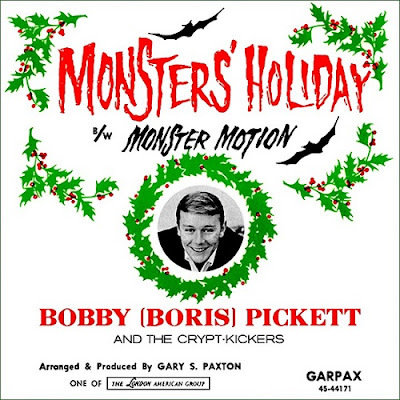 And luckily there have been many neat non-fiction books released recently that would make perfect gifts for horror lovers or those that appreciate darker, more morbid tomes. Below you'll find my suggestions for eight non-fiction books I think would make fantastic gifts, ranging from Halloween adult coloring books to picture books on gothic television shows and movies to horror artwork to dangerous fashion to horror memoirs and more! Who doesn't appreciate a beautifully wrapped gift? 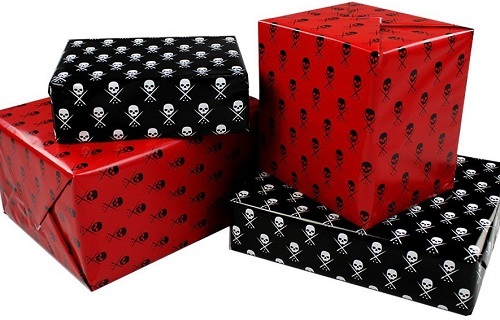 And while there is a lot of generic, boring red and green wrapping paper out there, you can find lots of unique wrapping paper online! I've gone ahead and done the legwork for you and I've found some fun wrapping paper on par with our dark aesthetics, whether it's gothic, Halloween, or horror-inspired. Krampus has been gaining in popularity over the last few years, and it's expected that popularity will explode with the new Krampus movie that just opened this past weekend (if you haven't yet, go see it! It's great fun!). 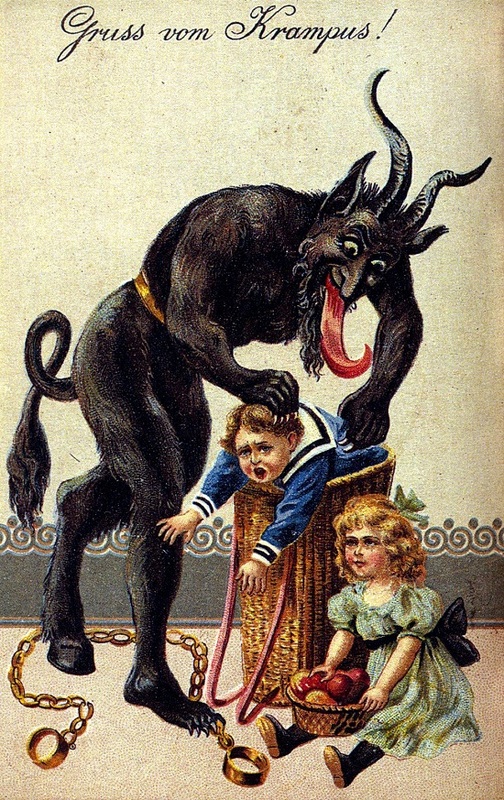 The love Krampus is getting is justified - who wouldn't love a scary monster who shoves naughty kids in a sack instead of bringing presents?! 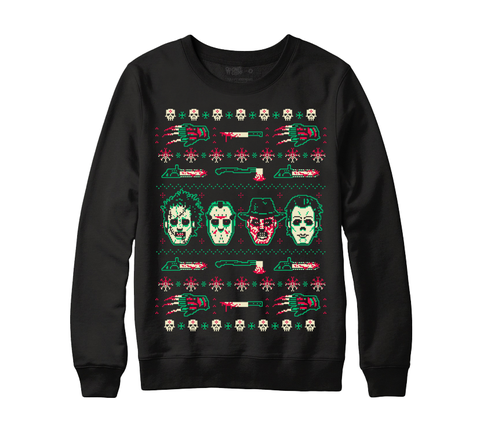 For Krampus lovers, this popularity is pretty cool considering all the awesome evil merchandise it has generated! With Krampus being well-known, you can now express your dark side during the holidays, with one of the many rad products with Krampus all over it. Are you sick of all the saccharine seasonal cards with sappy messages? Do you want a holiday card that reflects your spooky side? 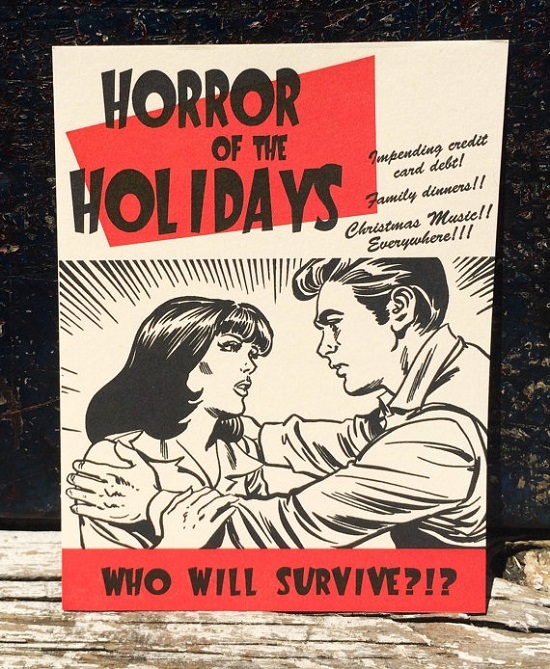 Well, I've scoured Etsy and found some fantastic horror-day cards that will delight our dark hearts! I've always wanted to visit Philadelphia - there are so many places to I want to go in and around the City of Brotherly Love, and my bucket list includes the fancy and highly rated restaurant Vedge, the gorgeous Laurel Hill Cemetery (oh, to explore the old gravestones there would be heaven), Grindcore House coffee shop (metal music and vegan goodies?? YES PLEASE), the Mütter Museum (housing a collection of medical oddities, anatomical and pathological specimens, wax models, and antique medical equipment), Charlie Was a Sinner bar (slinging vegan drinks and eats), Vegan Treats (a few hours outside the city, but I'm sure their treats are well worth the drive! ), and, now, V Marks the Shop, a new vegan convenience store that wants to join the burgeoning vegan scene in Philly. "As fierce winter winds cut across the frozen landscape, a welcoming golden glow beckons from the windows of a venerable country mansion. Decorated in the festive trappings of Yule, its stately walls seem to offer a much-needed respite for the weary traveler. 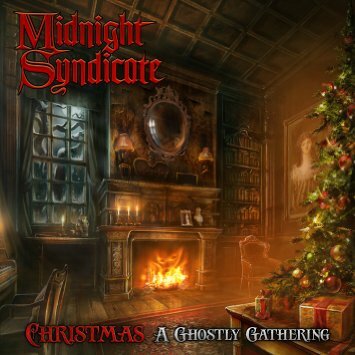 But the holiday spirits are restless and eager for company this night, as the haunting strains of melodies old and new call forth from the shadows." This gift guide came about for rather selfish reasons, I must admit - all these goodies are items I would LOVE as gifts for myself this season. I am lusting over beautiful baubles, witchy subscription boxes, beautifully bound books, an array of cruelty-free, dramatic makeup, glittering jewels, scintillating scents, recluse-themed clothing, eerie accessories, and music! Take a peek below to see what's on my wish list and get some ideas for what to ask for/buy for yourself this year! 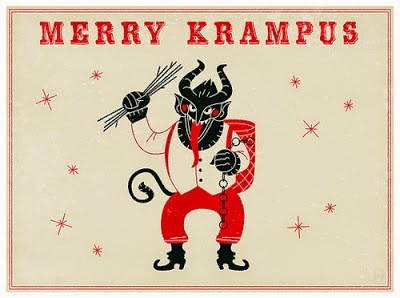 Merry Creepmas, all you naughty boils and ghouls! 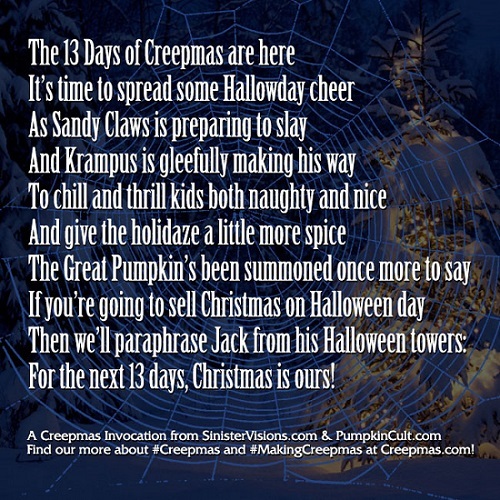 Today marks the start of 13 devilish days of Creepmas, when we creepy kooks inject some Halloween into the holidays and make it a spooky season, filled with good cheer fear! How will you be celebrating Creepmas this year?